Being boiled and drank, it provokes women's courses, and expels the dead child and after-birth, and stays the disposition to vomit, being taken in water and vinegar mingled together. And being mingled with honey and salt, it voids phlegm out of the lungs, and purges melancholy by the stool. Drank with wine, it helps such as are bitten and stung with venomous beasts, and applied to the nostrils with vinegar, revives those that are fainting and swooning. 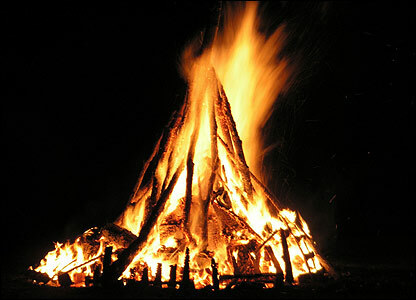 Being dried and burnt, it strengthens the gums. 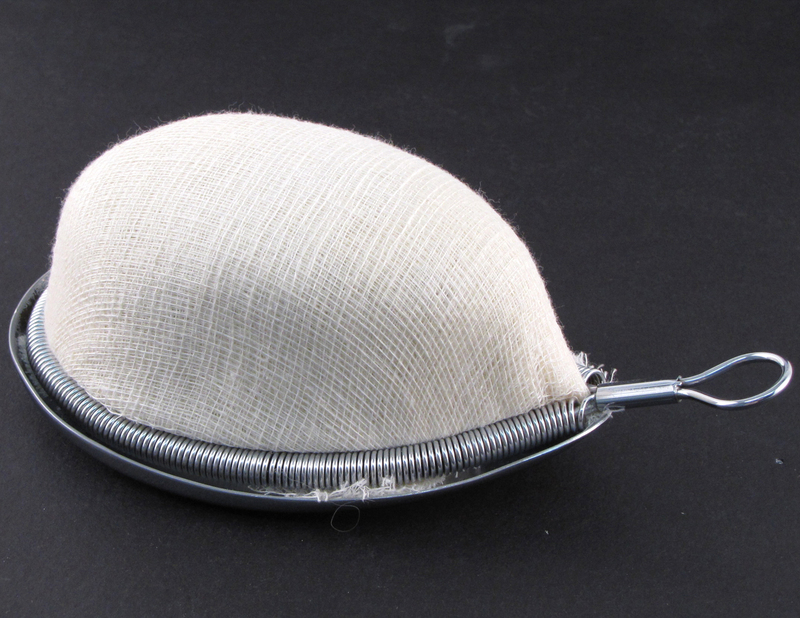 It is helpful to those that are troubled with the gout, being applied of itself to the place until it was red; and applied in a plaister, it takes away spots or marks in the face. The bugs had been a ubiquitous plague. 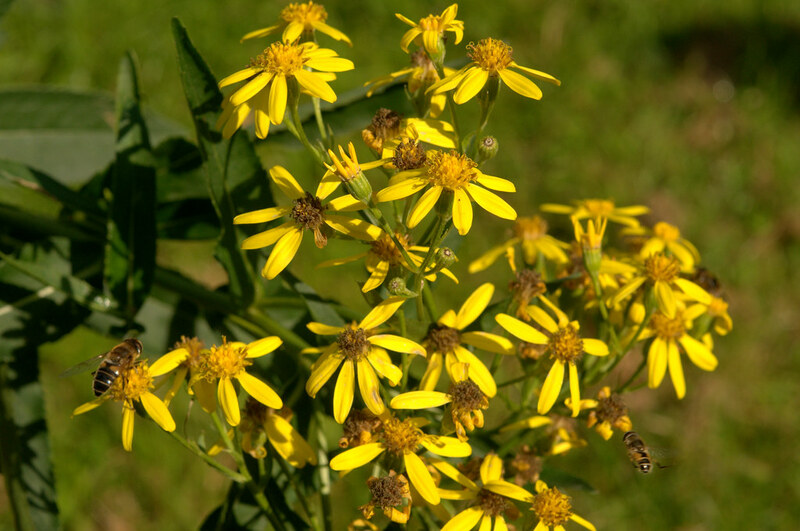 I inspected Jamie’s skin minutely every morning, picking voracious ticks and wood fleas from his crevices, and anointed all of the men liberally with the juice of crushed pennyroyal and tobacco leaves. This kept them from being devoured alive by the clouds of mosquitoes, gnats, and carnivorous midge that hung in the sun-tinged shadows of the woods, but it didn’t prevent the hordes of inquisitive bugs from driving them mad with a constant tickling inquiry into ears, eyes, noses, and mouths. 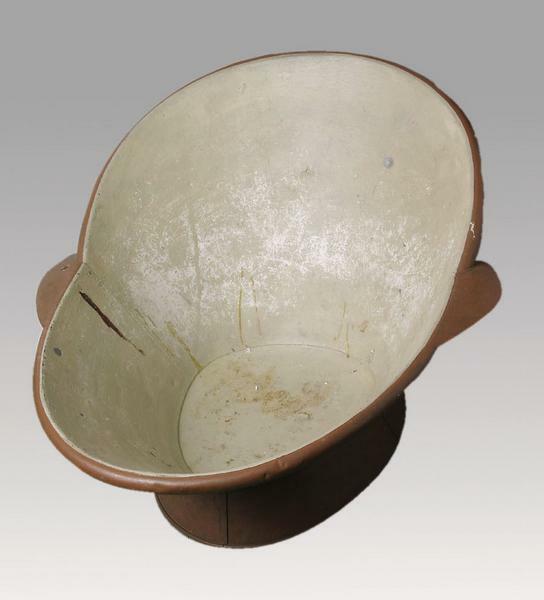 2) This photo shows a hip bath made from galvanized tin. 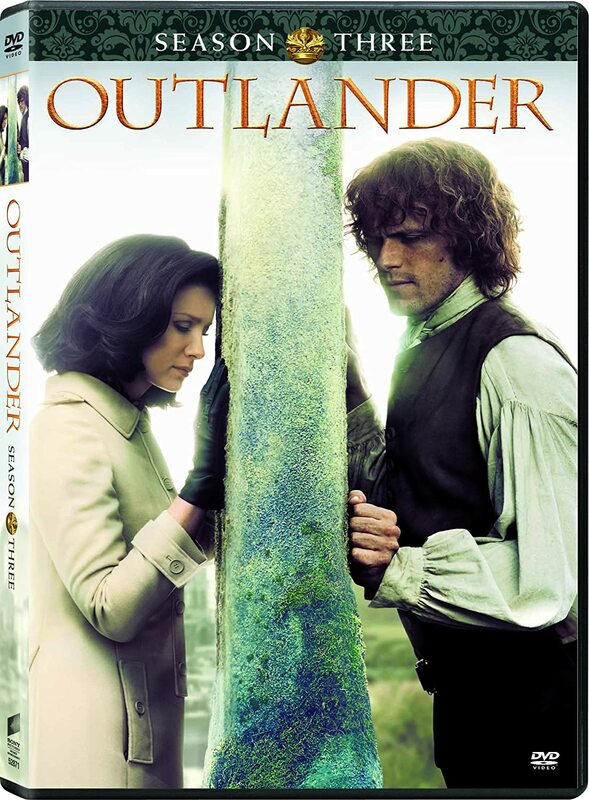 This example dates from the 19th century, but I imagine the ones used in Jamie and Claire's time would have been similar. As the door closed behind the maid, Jamie relaxed into the tub, high at the back to allow for lounging; the feeling of the times seemed to be that once having gone to the trouble of filling a bath, one might as well enjoy it. His stubbled face assumed an expression of bliss as he sank gradually lower into the steaming water, a flush of heat reddening his fair skin. His eyes were closed, and a faint mist of moisture gleamed across the high, broad cheekbones and shone in the hollows beneath his eyesockets. 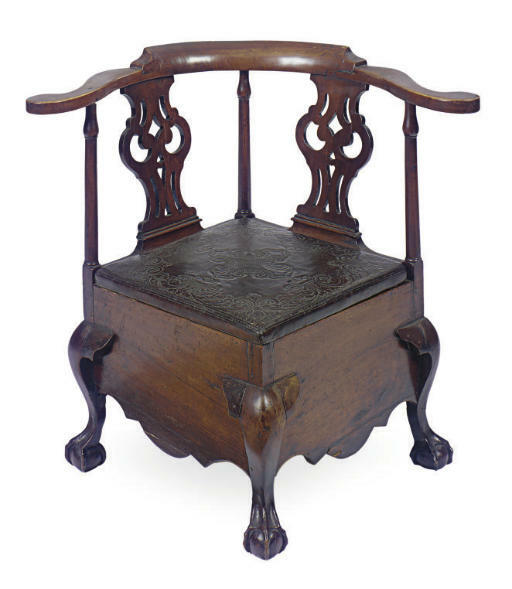 This is a bathtub used by King George III at Kew Palace. For more information, look here. A bridie was a plump hot pie in a half-moon shape, filled with minced steak and suet and spiced with onion. A rush of hot, rich juice and flaky pastry filled her mouth, and she closed her eyes in bliss. The bridie was bloody marvelous, Brianna decided, even if it did keep dropping crumbs down the top of her bodice. 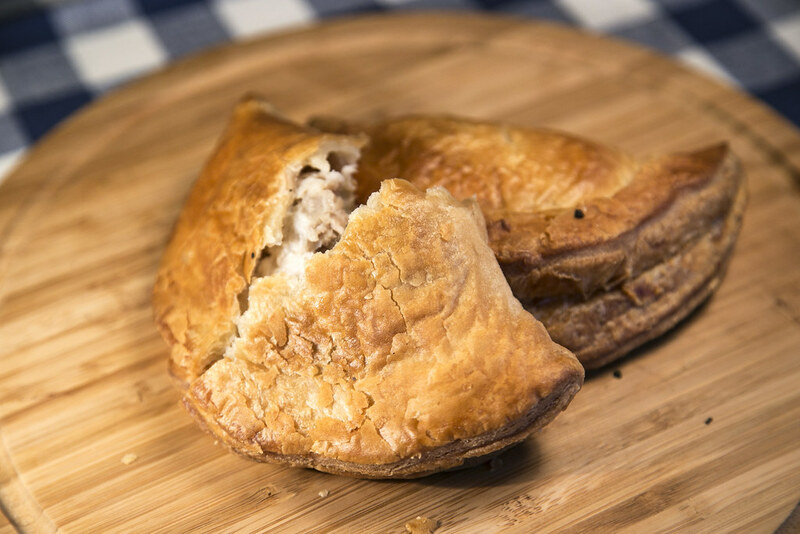 These tasty meat-filled pastries are sometimes known as Forfar bridies, for the town in Scotland where they originated. I've only tried one once, at a Highland Games a few years ago in North Carolina, but I thought it was delicious. If you'd like to try making them yourself, check out Brianna's Bridies from Outlander Kitchen, or look here for another recipe. 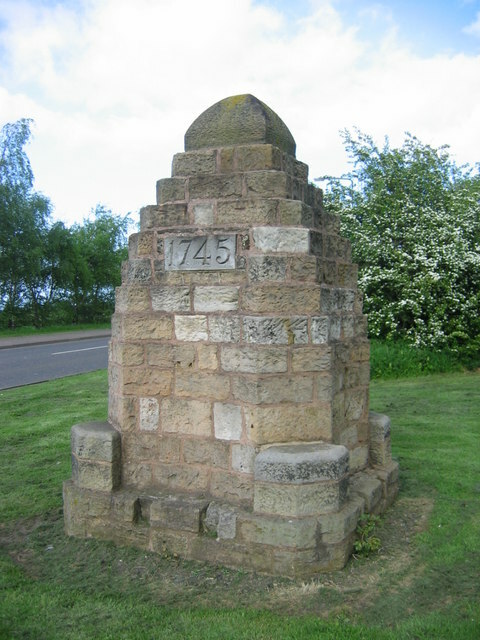 4) This is the memorial to those who fell in battle at Prestonpans, in September 1745. 5) Here's a video of "Birnie Bouzle", performed by Drinkers Drouth. "Don’t forget your guitar!” Bree called after [Roger] as he headed for the door. He glanced back at her, surprised. “A list? 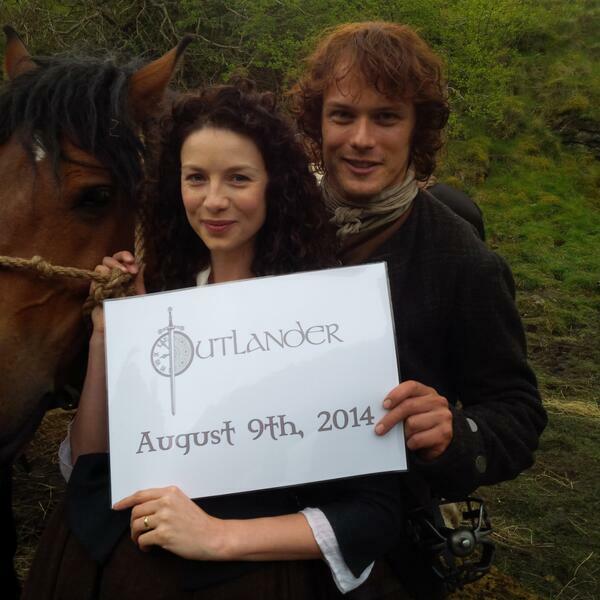 Of what?” To the best of Roger’s knowledge, Jamie Fraser paid no attention whatever to music. 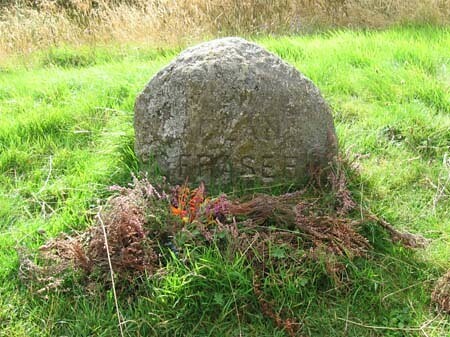 It rankled him a bit, in fact, though he seldom admitted it--that his own greatest skill was one that Fraser didn’t value. “Songs, of course.” She furrowed her brow, conjuring up the memorized list. “He wants you to do ‘Ho Ro!’ and ‘Birniebouzle,’ and ‘The Great Silkie’--you can do other stuff in between, he said, but he wants those--and then get into the warmongering stuff." 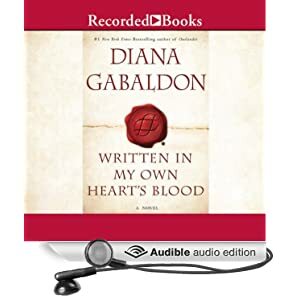 I had never heard of this song before I read THE FIERY CROSS, but I like it very much. You can see the lyrics here. This will be the last all-new installment of the Friday Fun Facts for a few months. 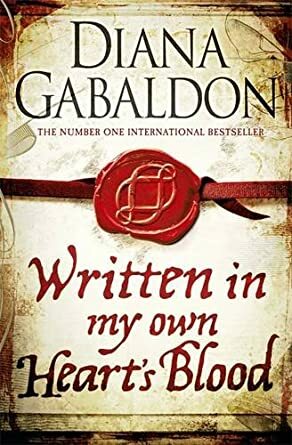 With the publication of WRITTEN IN MY OWN HEART'S BLOOD only days away now, and the TV series premiere on August 9, I'm going to be extremely busy trying to manage the discussions on Compuserve, and I just won't have the time to do the research that the FFF requires. 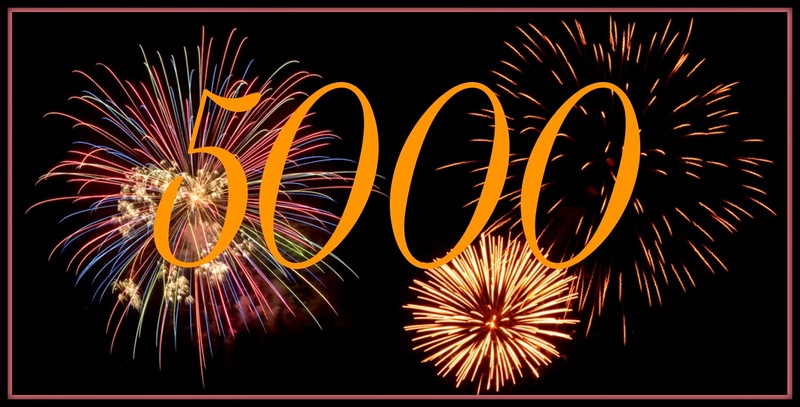 I'm celebrating a blogging milestone today: My Outlandish Observations Facebook page now has 5000 followers!! 1) This is an example of an 18th-century art form known as the portrait miniature. In the era before the invention of photography, such miniatures were extremely popular. This portrait of Susan Mary Farington, painted by an unknown artist around 1792, always makes me think of the "Lady, with Brown Hair Curling Luxuriantly", from DRAGONFLY IN AMBER. 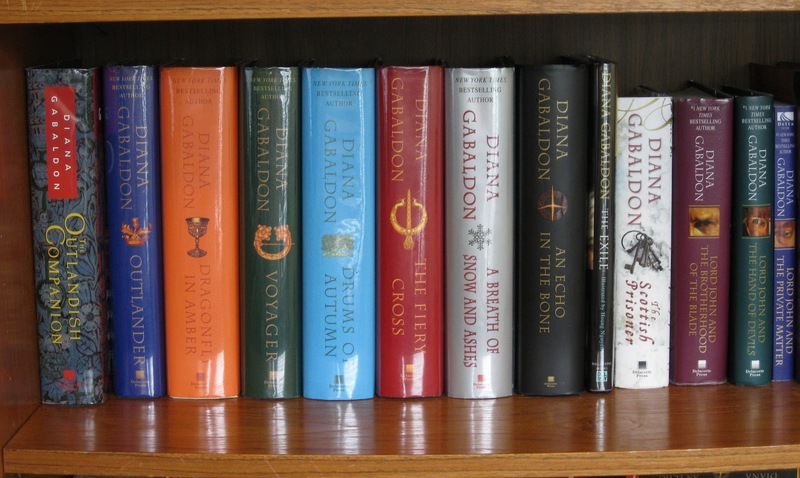 "A Lady," [Frank] said softly, cradling the last of the portraits in his palm, shielding it for the moment. 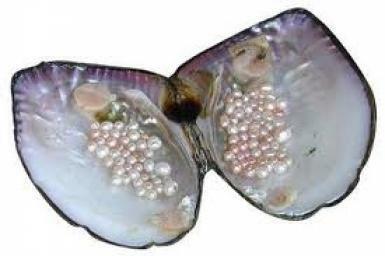 "With brown hair curling luxuriantly to her shoulders, and a necklace of pearls. Undated. The artist unknown." 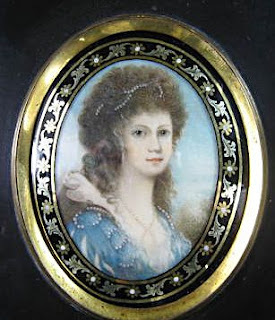 Most 18th-century miniatures were painted in watercolor on ivory. 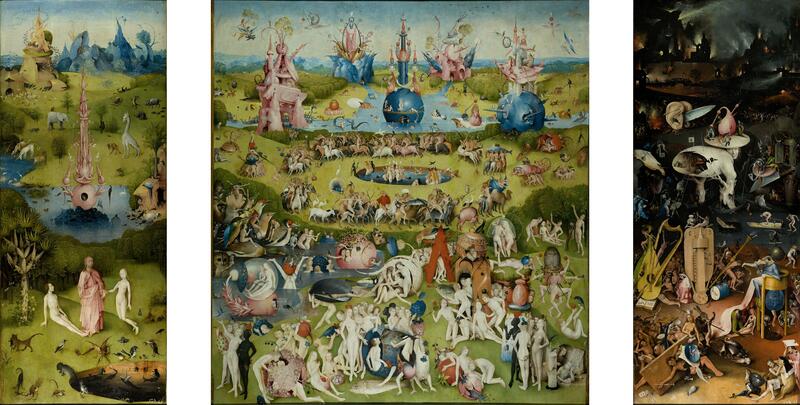 Here is a slideshow of miniatures from the collection of the Metropolitan Museum of Art. You can see many more examples here. On 28 April 1733, there was a terrible destruction of portrait miniatures in a fire at White's Chocolate and Coffee House [in London]. Sir Andrew Fountaine rented two rooms at White's to temporarily hold his huge collection of portraits done by Hilliard, the Olivers, Samuel Cooper, and others. The entire house burned down; the number of paintings destroyed was so large that the ashes were carefully sifted to recover the gold from the incinerated mountings of the miniatures. 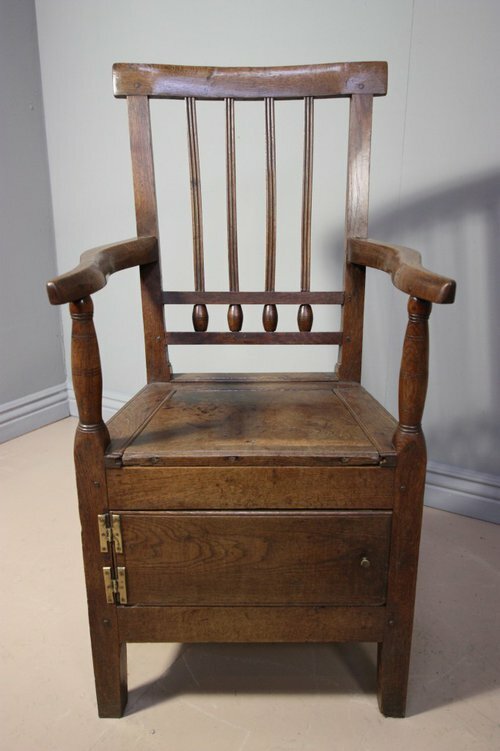 For more about the history of miniatures, look here and here. 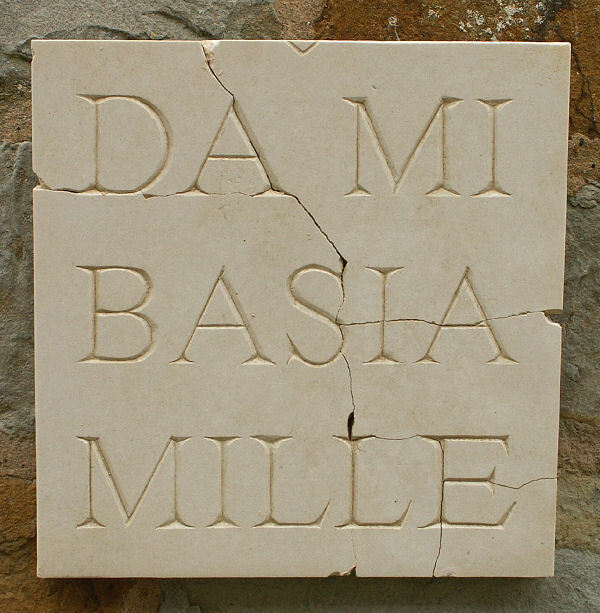 2) The inscription inside Claire's silver wedding ring reads, "Da mi basia mille" -- Give me a thousand kisses. It's a quote from a poem by Gaius Valerius Catullus, a Roman poet who lived from about 84 BC - 54 BC. A Hundred, and a Thousand more. Catullus dedicated this poem to his lover, known by the pseudonym of Lesbia. You can see the full English translation here. And here is an interesting blog post about Catullus and his poetry. I nodded, rolling up a length of boiled linen for bandaging. It was still very damp, but no help for it. The mother had come simply to have a gumboil lanced, the little boy clinging to her skirts. He’d had the characteristic “saddle nose,” with its pushed-in bridge, as well as a jaw so malformed that I wasn’t surprised at his poor nutrition; he could barely chew. I couldn’t tell how much of his evident backwardness was due to brain damage and how much to deafness; he appeared to have both, but I hadn’t tested their extent--there being exactly nothing I could do to remedy either condition. I had advised the mother to give him pot liquor, which might help with the malnutrition, but there was little else to be done for him, poor mite. 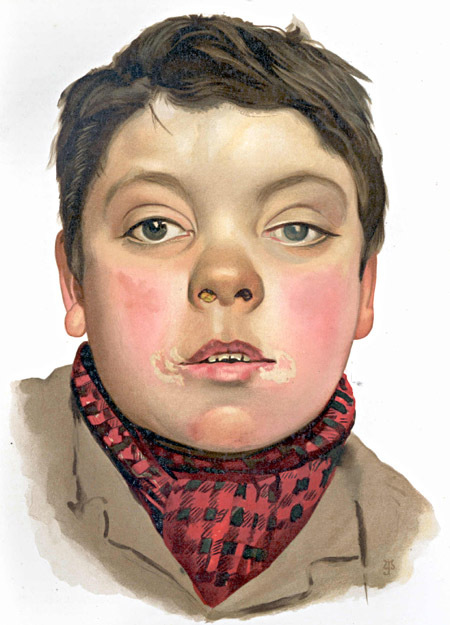 In addition to the nasal deformity, children born with syphilis often have what are known as Hutchinson's teeth: peg-shaped, notched incisors. For more information about congenital syphilis, look here and here. 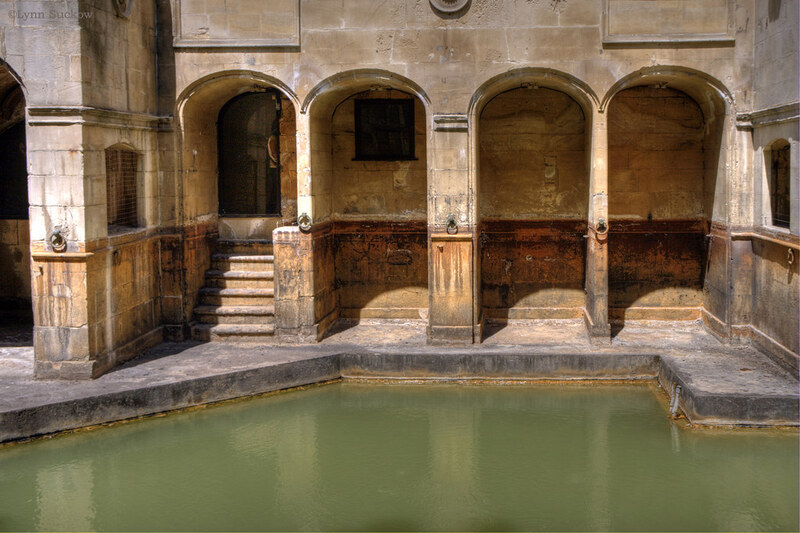 4) This photo shows the ancient Roman baths at Bath, England. 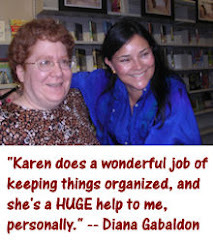 (Photo credit: Lynn Suckow, on Flickr.) The water is green due to the presence of algae. I love Hal's description in AN ECHO IN THE BONE of his experience "taking the waters" in Bath. It always makes me laugh. I'm not dead. Wish I were. Bath is vile. I am daily wrapped in canvas and carried off like a parcel to be sunk in boiling water that smells of rotten eggs, then hauled out and forced to drink it, but Minnie says she will divorce me by petition in the House of Lords on the grounds of insanity caused by immoral acts if I don't submit. I doubt this, but here I am. For more about Bath's hot spring, look here. 5) This photo, from Wikipedia, shows a piper in Edinburgh playing the Great Highland Bagpipes. There was a piper walking next to me; I could hear the creak of the bag under his arm and see the outline of the drones, poking out behind. They moved as he walked, so that he seemed to be carrying a small, feebly struggling animal. I knew him, a man named Labhriunn MacIan. 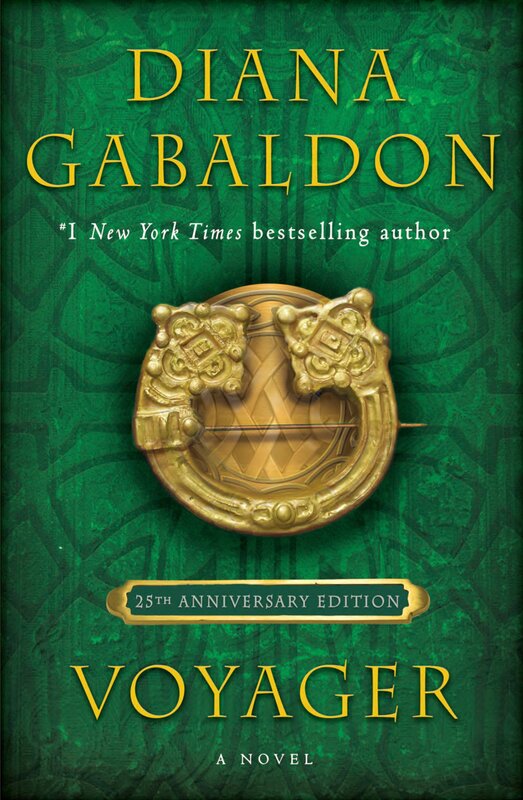 The pipers of the clans took it in turns to call the dawn at Stirling, walking to and fro in the encampment with the piper’s measured stride, so that the wail of the drones bounced from the flimsy tents, calling all within to the battle of the new day. This diagram shows what the different parts of the bagpipes are called. For more information, look here. For more about the history of bagpipes, look here. Finally, I thought this video (from the College of Piping in Prince Edward Island, Canada) was too cute not to share. 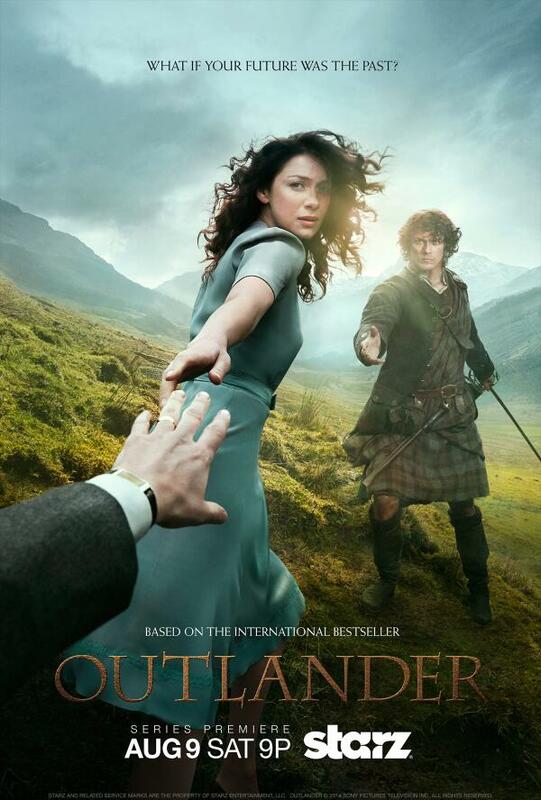 Important update for OUTLANDER fans in the UK, Australia, and New Zealand! 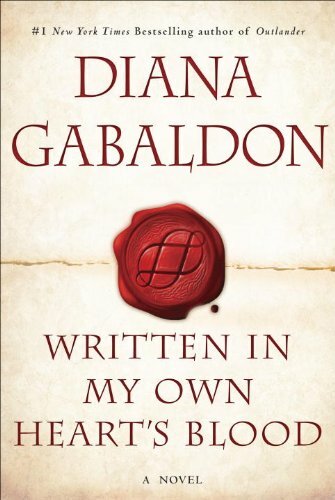 According to the website of Orion Books (Diana Gabaldon's UK publisher), WRITTEN IN MY OWN HEART'S BLOOD will be published on 10 June 2014. 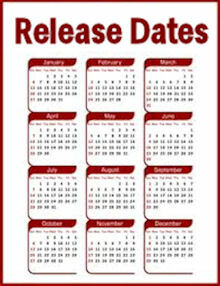 In other words, the UK edition is now scheduled to be published the same day that the book comes out in the US and Canada. 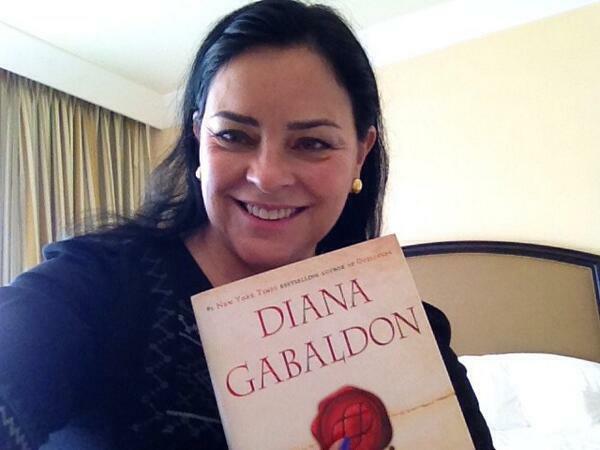 If I hear back from Diana with confirmation of the date change, I will update this post. But I'm presuming it's accurate unless she says otherwise.